Published: Nov. 11, 2015 at 03:19 p.m. Updated: Nov. 11, 2015 at 04:43 p.m. It can be hard for rookies to make the Pro Bowl, given that they generally don't have the visibility or established reputations of some of the standout veterans who dominate headlines. But that doesn't change the fact that several rookies have Pro Bowl-caliber seasons each year. With that in mind, I've listed my top 10 rookie Pro Bowl candidates, plus one bonus rookie (*) who deserves to be mentioned even though he’s got no chance to make the team. The players are ranked in descending order, from most likely to actually make the Pro Bowl to least. Gurley is a special player and a special person. What he's done is unbelievable, given that he's an NFL rookie and just about a year removed from tearing his ACL. He's as good as any rookie back we've seen in the last 10 years. Last year, the Rams ranked 20th in the NFL in rushing; this year, though Gurley has started just five games, they rank fourth. 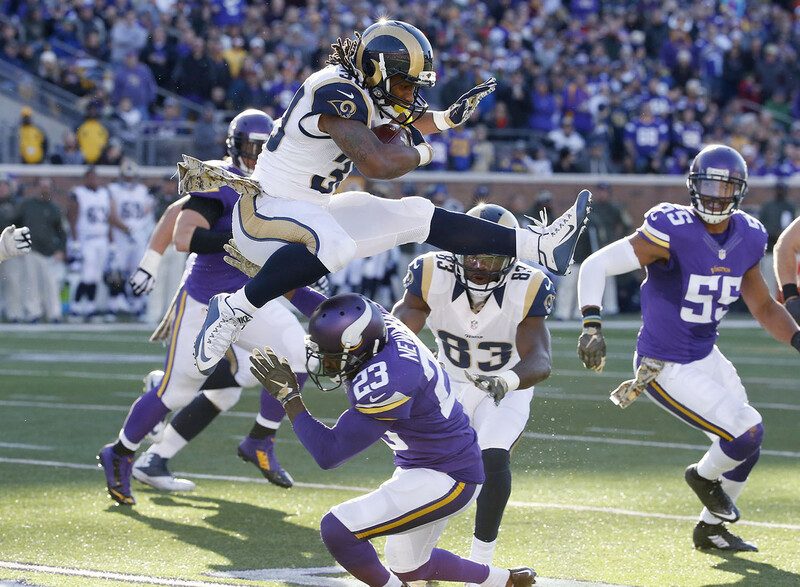 Gurley is averaging 131 rushing yards per game as a starter. If he can keep that pace up, he will, incredibly, finish with 1,712 rushing yards -- within shouting distance of the rookie rushing record (1,808 yards) set by Eric Dickerson in 1983. The hype is fully justified. The Raiders' passing attack ranks eighth in the NFL after finishing 26th in 2014 -- and Cooper is a big reason for that. He's a legitimate No. 1 receiver, size-wise and speed-wise, who excels at picking up yards after the catch. He already has three 100-yard games to his name and is averaging a robust 14.5 yards per reception. Receiver is a stacked position, making his Pro Bowl odds long, but he'll be a marquee player for years to come. The second-round pick has 15 pass breakups and has been burned on just 48.4 percent of the balls thrown his way -- anything under 50 percent is very good. He's also chipped in two picks and 44 tackles. He's physical, can play press coverage, makes flash plays and has good speed. Right now, he's playing as well as any corner in the league. Peters has been in on 96 percent of the Chiefs' defensive plays, notching three picks, including one for a score, and 14 passes defensed, fourth-most in the league. He hasn't played as well lately as he did at the beginning of the season, but I don't see any reason why he can't return to that level of play. The fact that the ninth overall pick in the draft is starting at left tackle in the NFL despite having played just three years in college is significant, given that offensive-line prospects typically need time to develop. Flowers has length -- and he knows how to use it. Offensive line coach Pat Flaherty really seems to have done a good job with him, as far as awareness and his ability to handle speed rushers are concerned. Eli Manning has been sacked 12 times, putting him on track for 21 -- a marked decline from last season's total (28). Flowers has had a lot to do with that. The fourth-round pick has speed and excellent recognition skills. He's posted 59 tackles -- second-most on the team -- in eight starts, along with a sack, a forced fumble and two picks, contributing heavily to Tampa Bay's improved defense. Alexander, who has notched double-digit tackles in two consecutive games, has little chance of cracking the Pro Bowl, but he's having a Pro Bowl-caliber season, and should be making all-star teams before long. When you watch tape of Marpet, his man doesn't make plays. He's smart, competitive and a great run-blocker, making an impact on a line that has helped Tampa Bay notch the fewest three-and-out drives in the NFL this season. He might have played Division III college ball, but he looks like he definitely belongs in the NFL. I like both Marpet and fellow rookie Donovan Smith, who's manning the left tackle spot in Tampa, but I like Marpet better this season. Williams is every bit as good as his reputation suggested coming in. The sixth overall pick might be slightly overshadowed by dominant teammates Muhammad Wilkerson and Sheldon Richardson, but he's definitely playing a key role in the Jets' fourth-ranked defense, chipping in 27 tackles and a sack. Williams can rush the passer and stuff the run, and he can play inside or outside, making him an ideal fit for coach Todd Bowles. It's tough -- though not unheard of, especially with all the replacements who are eventually called in for veterans skipping the game -- for rookie quarterbacks to reach the Pro Bowl, but Mariota is really having a very good year. He has started six games and is averaging a solid 8.1 yards per attempt. He's much better against the blitz than you'd expect a rookie to be. He'll be a Pro Bowler someday. Winston has improved with each start. He seems so much more poised now than he did in his shaky Week 1 debut; he has such a better handle on where to throw the ball. I suspect coordinator Dirk Koetter has had a lot to do with Winston's growth. Like Mariota, the first overall pick in the 2015 NFL Draft has Pro Bowl potential in the future. Think of this as a bonus pick. Hicks has no shot to make the Pro Bowl, seeing as how he was placed on injured reserve this week, but he was performing at a Pro Bowl level before getting hurt. The third-round pick had recorded two interceptions (including a touchdown), plus 50 tackles (second-most on the team), a sack and a forced fumble. Hicks can make plays against the run and in space, and he projects as a pretty good player in the Eagles' system.